A haplotype is the set of genes at more than one locus which is inherited by an individual from one of its parents. While the theory of population genetics for a single locus is concerned with gene frequencies; the analogous variable in two locus population genetics is haplotype frequency. For two loci with two alleles each (A1 and A2, B1 and B2) there are four haplotypes, A1B1, A1B2, A2B1, A2B2. A diploid individual’s genotype will be something like A1B1/A1B2 (the oblique stroke here indicates diploid genotypes): it has two haplotypes, one inherited from each parent, just as a one locus genotype contains two genes from the two parents. A haplotype can be specified for any number of loci. 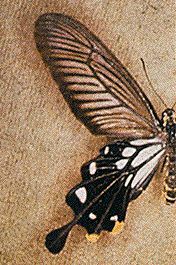 For example, the mimetic patterns of Papilio memnon (pictured opposite) are controlled by a set of five genes. The frequency of a haplotype in a population can be counted as the number of gametes bearing a particular combination of genes. To understand the evolution of haplotype frequencies, we need some concepts that do not exist for gene frequencies, in particular linkage disequilibrium.